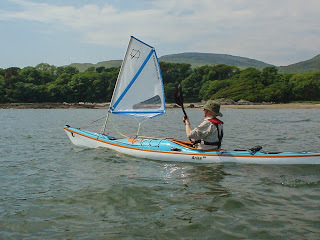 The P&H Aries 155 as a beginner's kayak. 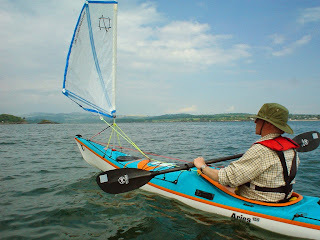 The Aries 155 is rapidly becoming my favourite kayak. Its versatility gives it appeal to experts in the surf and for those that like paddle sailing, it is unsurpassed by any of the kayaks I have tried. It is also good for beginners, though I should point out that this is my own opinion and I have no coaching qualifications. I am aware that some coaches think the Delphin and Aries are not suitable for beginners. Anyway David is 74 years old and this is his first kayak lesson. His only previous experience in a canoe was 50 years ago and lasted for 15 minutes until he fell out. 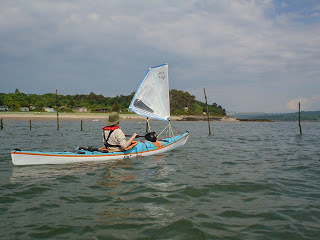 He soon mastered turning and bracing using the paddle alone and within 20 minutes of being on the water had the sail up. He soon had the hang of threading through the gaps between old salmon net poles. broad reaching. He even managed an occasional plane in the small waves. In all he covered 6km in his first lesson. Not only is the Aries a great kayak for beginners, this also demonstrates how accessible paddle sailing is with the Flat Earth kayak sail.